Johnny Thunder straps your G/Host Chris Baker down to the gurney and administers the lethal injection to put him out of his, and our, misery as we supposedly closes the dungeon door for the last time. Again. NOT! Jim Transue of Isher Creations makes the last call on the Bone Phone. Terra of Terra’s Lair presents her Best of Hauntcast. Join the the Scream Team in the Dungeon of Love as they are forced to listen to the worst podcasts imaginable as punishment for their 5 years of knuckle dragging buffoonery. Interviews with Robert Beech of Brandywine Cemetery, and Chris & Jeana Lesley of Hollywood Haunter with music by The Brains. HAUNTING GURU INTERVIEW: The Propmaster’s winner of Best Indoor Haunt in 2008 and best how-to in 2009, longtime haunter Noah Fentz of The Creepy House Next Door hangs out (from the rafters) in the dungeon. 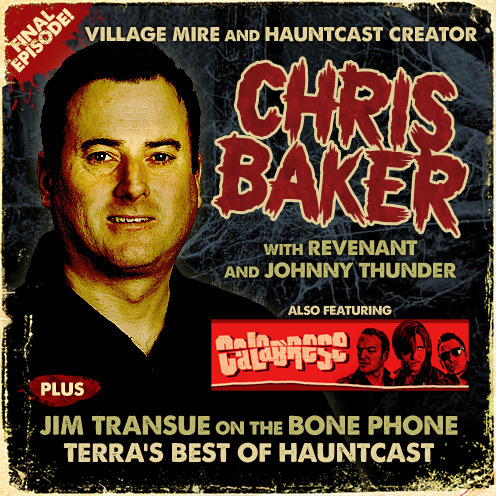 BONE PHONE: Roger Hayes crank dials Chris on the Bone Phone to pimp his Kickstarter campaign for Home Haunting for Mere Mortals how-to book. GHOULIE GROOVES: Taking you by the hand and leading you Hellbound, Canadian rockers The Creepshow bury Chris alive after they marry the Devil's Son. SHOCKTAILS: JT and Chris fall off their bar stools after consuming cases of IPA while blathering about the plethora of horror movies dropping this month as well as reviewing Patrick. THE MARKETING MORGUE: Mr. Terhune gets the munchies for Cookies of Evil and how Girl Scout Cookie marketing relates to your haunt. THEATER OF THE MIND Revenant notices that some of the spookiest stuff out there can be remembered from our own childhoods... and that ain't no fairy tale. THE CHARMED POT: Frankenfooted Shellhawk hobbles into the Mystery Machine and drives back into time to pull the mask off our favorite Horror related cartoons from our past. THE PROP SHOP: Denny gives his past two years as Hauntcast’s prop guy a reach around and climaxes with his final prop building tips. TERROR TURNPIKE: Vysther road trips to Creepy World in Revenant’s backyard, St. Louis, MO. MAD PROPS FOR PROPS: The creative mind behind the Garage of Terror is opened up and laid bare with James' Brain-pan Head Dissection prop, 1st place winner in Haunt Forum's 2013 Propbuilder's Challenge. HAUNTING GURU INTERVIEW: Master chef of the deliciously spooky Creepy Hollow Haunted House, Brett Baker, joins Chris in the dungeon to swap haunt recipes and pound green beer. GHOULIE GROOVES: Rockers The Rocketz take you on a far out ride into the cosmos with music from their new album “California Hell”. SHOCKTAILS: JT pours you a tall glass of horror at the last bar on the left while reviewing movies Nurse and Haunt. THE MARKETING MORGUE: The Dark Lord returns from hibernation to celebrate the convention season which is in full bloom. THEATER OF THE MIND: Nature may be spooky and even uncanny, but adding technology to it can make it downright horrifying. THE CHARMED POT: Shellhawk rests her bunions and threatens to return next month. THE PROP SHOP: Denny shines the spotlight on the overhead projector as an invaluable tool for foam carving. TERROR TURNPIKE: Vysther drives his beater to Sandusky's Ghostly Manor Thrill Center and Dent Schoolhouse. MAD PROPS FOR PROPS: Got head? Paul Hallenbeck of the Mad City Haunt does, but it won't last long in his Flesh Eater Tank.